It’s finally starting to feel a bit like fall in Chattanooga. Ever since the hurricane rains swept through town during early October, the Chattanooga area has been blessed with some seriously sensational autumn weather. Cloudless, bluebird days have been the norm of late, and the leaves are finally starting to turn in the higher elevations of Lookout and Signal Mountain. It’s true: crisp weather like this makes holing up in a coffee shop or in front of a fireplace quite an appealing prospect, but then again, you have all winter to do that. Instead, why not take to the woods and waterways of Chattanooga for some active exploration? After all, there’s quite possibly no better time to live and play in the Scenic City than now. Lula Lake, just outside of downtown Chattanooga, is one of the most impressive destinations in the Southeast in terms of beauty. To experience one of the most scenic locations in the Chattanooga area, it pays to plan ahead. Lula Lake Land Trust has breathtaking views around most every corner and over six miles of trails, making it a prime destination for a great hike. However, the property is open to the public only on the first and last Saturday of each month, excluding certain holidays. Save the date! You&apos;ll be glad you did. When hiking at Lula Lake, there are three must-see locations. The first is the upper falls and Lula Lake itself, viewed from an old railroad bed dating back to the 1800s. This lake is as picture-perfect as they come with a small waterfall feeding into brilliant turquoise waters. 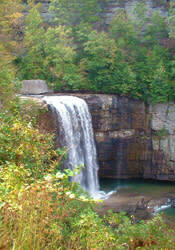 The second location is the lower falls, best viewed from the bottom after descending a steep and rugged trail. This path is not for the very young or frail, but the sight of the falls dropping nearly 100 feet into a huge basin below makes it worth the effort. A final must-see location is the panoramic vista from the shaded, grassy east brow of the mountain. The route to the top is either a double-track gravel road or a singletrack hiking trail, both with moderate climbs, but the overlook of the Chattanooga Valley provides ample reward. The Tennessee Riverpark offers quick, safe access to one of the most popular paddling destinations in Chattanooga. From the floating canoe dock at South Chickamauga Creek, you can paddle for miles in either direction. Downstream, it’s just a third of a mile to the big waters of the Tennessee River, where the best paddling is near the shore. Upstream, the creek beckons with abundant shade, calm water and low traffic. At various points, the South Chickamauga Creek Greenway parallels the water. Two miles from launch, you’ll reach a boat ramp at the Sterchi Farm. At normal water levels, the current doesn’t begin to get strong or the water shallow until you near Lightfoot Mill Road, about five miles upstream. 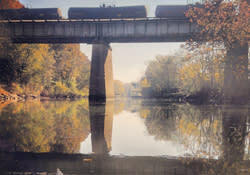 The calm waters of South Chickamauga Creek are ideal for paddlers of any ability. Advanced paddlers may wish to venture out onto the Tennessee River, perhaps paddling to downtown. With Raccoon Mountain closed down from October 17-November 21 for routine reservoir maintenance, mountain bikers in the Scenic City must look elsewhere. Queue Enterprise South Nature Park, located off Volkswagen Drive near the Volkswagen plant, only 20 minutes from downtown Chattanooga. There are three trails open for mountain biking (Black Forest, TNT, and Log Rhythm), totaling about 13 miles, with additional trails accessible to hikers and trail runners. Black Forest Trail is a great beginner loop that is fast and easy with little elevation changed and no technical obstacles. TNT offers more elevation change, lots of grade reversals (rollers and whoop-de-doos), and some rocky, root-filled sections. A small pump track is also accessible off of TNT. Both Black Forest and TNT are directional depending on the day, so follow the signs at each intersection. 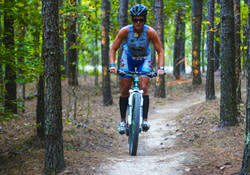 The Log Rhythm Trail is one way all the time, beginning with a steep climb that leads to an extended rolling downhill. It also, as the name implies, has optional log rides and bridges for a more technical ride. The Big Daddy Loop on the Bluff Trail, a great 10-mile single track loop. The Guild Hardy Trail, a 5-mile trail leading up an old railroad bed. 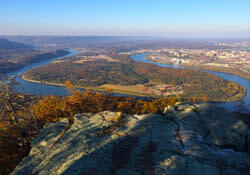 Point Park Loop, a 4.5-mile trail that takes you to arguably the best overlook of beautiful Chattanooga. All of these trails are moderately technical and moderately difficult. Panoramic vistas of rolling ridges and valleys await behind most every bend. If any crag can be considered the “crown jewel” of southern sandstone climbing, Sunset Park surely must be it. 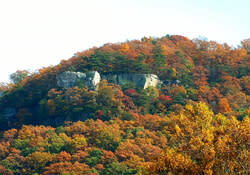 Located on the west brow of Lookout Mountain in the Chickamauga National Battlefield Park, Sunset is considered the heart of the Chattanooga climbing scene. It was where most of the leading sandstone route activists first cut their teeth and pushed the standards of difficulty. One visit to this area and you’ll know why: exquisite rock, friendly approach, and lots of high quality routes. Sunset Rock is a long, linear cliff line that runs along the bluff on the north side of Lookout Mountain. From the parking area, a quick five-minute walk leads to the base of the main overlook, Sunset Rock proper. On the approach, you will pass a number of routes, some of which are closed to climbing, until you reach the base of Sunset Rock. This buttress offers traditional routes in all difficulties that can be easily top-roped or led.